Pollution beater. 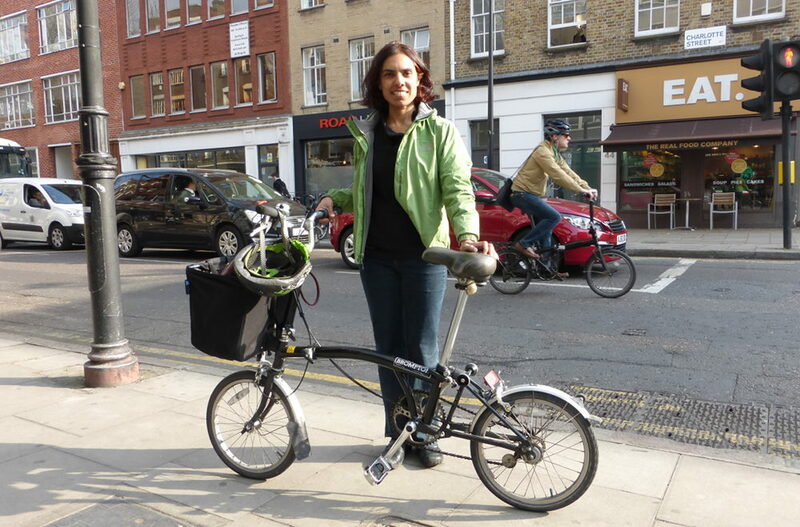 Maya de Souza commutes from Highgate to Millbank and back on her Brompton folding bicycle. Maya de Souza passes through Fitzrovia on her commute to work from Highgate to Millbank. Cycling from the north to the south of the London Borough of Camden and into the City of Westminster gives her the opportunity to see at first hand the challenges of managing London's environment. It's something that comes in handy in her work with Defra and as a local councillor. I met Maya for coffee on the corner of Goodge Street and Charlotte Street. 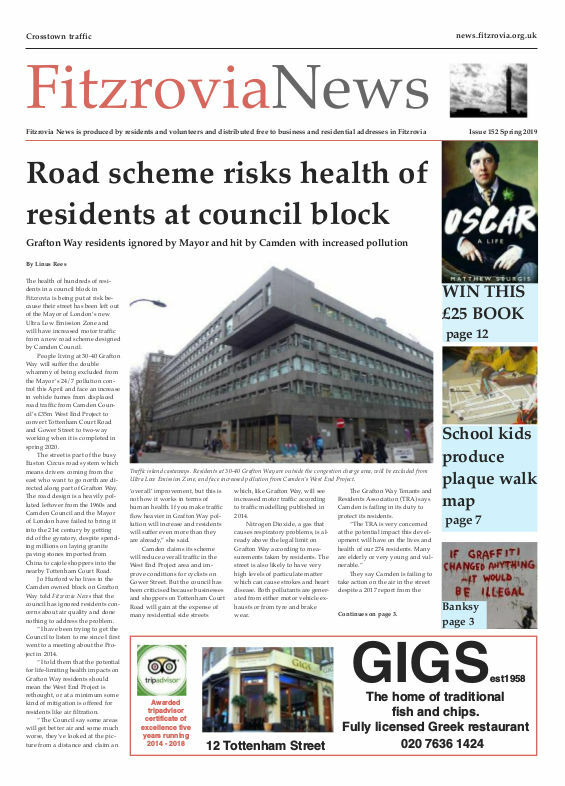 She has been a Green Party councillor for Highgate since being elected to Camden Council in 2006. She wanted to know what’s going on in Fitzrovia and was curious to know more about the redevelopment of the former Strand Union Workhouse site in Cleveland Street where the issue of conservation and affordable housing has been a subject of intense debate locally. She is aware of the concern about the loss of the oldest building on Goodge Street which was demolished at the end of last year. Pollution was also the topic of conversation as for the third day in a row smog was taking its toll on London’s population. Many people living and working in Fitzrovia are concerned about pollution levels and Maya tells me it’s a big issue for residents in Highgate, too. Maya does her daily commute on a Brompton folding bicycle. “I’ve had the bike for four years. Before that I had a Dahon folding cycle. But the Brompton is better — it’s a nifty thing folding-wise, manoeuvrable and feels lighter,” says Maya. Many everyday cyclists have more than one bicycle. I know a few people who have several bikes. How many does she have? Maya has a busy life and says she leaves any bicycle maintenance to the professionals. She’s a regular customer at Simpson Cycles in Malden Road, Kentish Town. Simpson’s has been selling and repairing cycles since 1947 but recently it has changed the way it operates after suffering loss of sales to online retailers. The owners complained people were coming in and looking at the bikes, asking lots of questions then went home to buy a similar model from a cheaper internet-only retailer. Dean and Scott Simpson got fed up with the time-wasters and decided to be more selective about who they let in their shop, installing a reception area to triage customers and filter out those who would buy online. 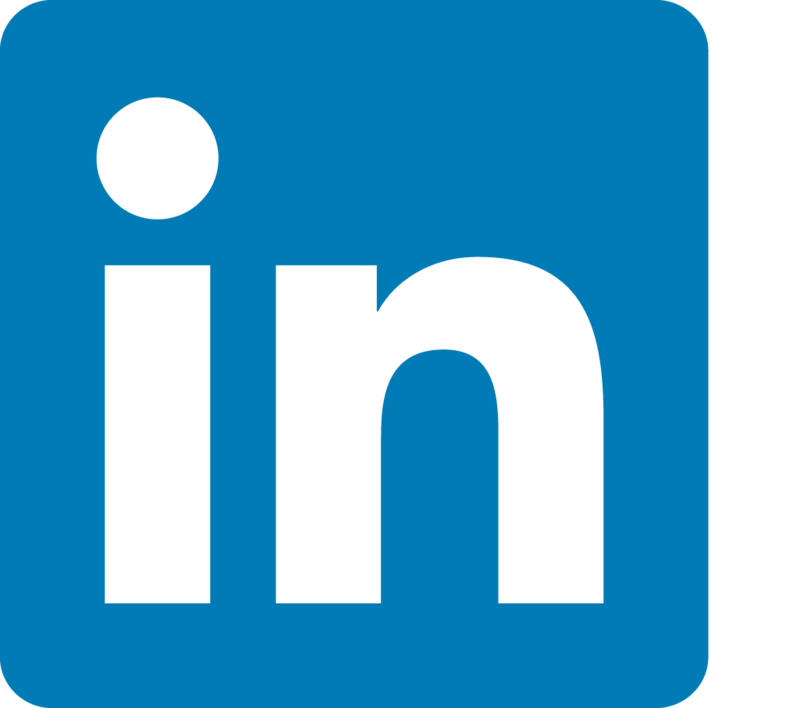 The shop has a loyal following of regular customers and they want to give them the best possible service. Maya says Dean and Scott always sort her bike out for her, and it’s not far off her route into work. “We have to remember that to have people like them in our areas we have to fork out that little bit more to allow them to cover their overheads. Time is the issue for me, and I happily pay others to do repairs for me,” she says. At the end of her morning journey she arrives at the Department of Environment, Food and Rural Affairs (Defra) at Millbank where she works as a policy adviser. From the eighth floor of her building she can take in some of London’s great sights. “It’s a view that makes one feel lucky to be alive,” she says. It takes her about 40 minutes for the ride in the morning and five minutes longer to get back home. “It feels a bit more of a journey on the way back. Sometimes I take a break maybe stopping in the shops in Kentish Town, normally the fantastically cosmopolitan Phoenician Food Hall or the Co-op. Better cycle routes and improved safety would encourage more people to cycle, says Maya. But the pedestrian environment needs to been improved as well. “More segregated routes like the Royal College Street one with plant pots. An improved route along the Bloomsbury Squares. And safer junctions. I’d like to see something innovative like a cycling only road but with a lovely paved area for pedestrians also. “We also need to take others out with us and then they’ll see it’s actually pretty safe and it’s amazing how healthy one feels.